We all know of the wit of Oscar Wilde, the man who famously stated, ‘The only thing worse than being talked about, is not being talked about.’ The searing wit of the legendary writer is at its most apparent in The Importance of Being Earnest, a comedic landmark in the parody of Victorian ideals and society. The play unfolds as the narrative of two central male characters, Algernon Moncrieff and Jack Worthing, both pretending to be the same invented man – Ernest – in order to persuade the women they love , both of whom are fanatically interested in marrying ‘some one whose name was Ernest’, to marry them. Though Wilde is infamous for his promotion of Aestheticism, the movement which proclaimed that art should be valued for beauty as opposed to any critique of social issues, it is apparent from the synopsis alone that Wilde is commenting rather successfully on the superficiality of such a society. The women desire men who have quite apparent faults, as well as quite glaring dishonesty, and judge on the name of a man alone his superior character – specifically, his ‘earnest’-ness. Such superficiality can be seen in this production of the play, in particular in a focus on flowers: two or three very large and prominent flower designs decorate the wall at the back of the stage – the only decoration to do so – and at the encore, pink rose petals fall from the ceiling. The costume design is charming and flawless, and set design is minimal but utilised in an impressive way. 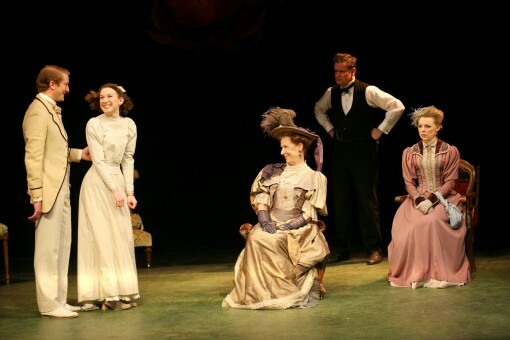 Several chairs are the main focus, and are either pushed forward for characters to sit on, or pulled back when characters stand or leave, by servants Merriman and the witty Lane – both played by Richard Stemp – to clearly demonstrate which of the characters is holding the dominant position at that particular moment. This is palpable to the audience when Merriman labours to push chairs forward, only to drag them back when discovering the character (in a chilling voice) would rather stand, or wouldn’t stay long. The acting throughout was impressive. The obvious star of the show is Harry Livingstone, playing Algernon, the trope, witty and sarcastic Wildean male. With a wicked whimsicality, Livingstone nailed the part. Paul Sandys’ portrayal of Jack is interesting as it takes Jack down a notch or two, presenting him as slightly whiny and somewhat socially awkward. Carmen Rodriguez gives a fantastic performance as the austere Lady Bracknell, and Helen Keeley, in her first professional role, does a superb job as her daughter Gwendolen. Felicity Houlbrooke as Cecily plays the woman coming-of-age in an energetic and lively fashion. When one reads the text, the women seem very similar to one another, but it must be remarked that costume design here is to be lauded for differentiating and individualising them. The actor for Miss Prism, Fair City’s Laoisha O’Callaghan, surprised by giving the character an Irish accent – fascinating in what this says about Irish and British class relations at the time (the character in question being a governess). It must be said, however, that out of an exquisite cast, O’Callaghan may be the weak link due to what seemed hyperbolic over-acting. Peter Cadden as Rev. Canon Chasuble gave a top-notch performance and Richard Stemp, in playing two characters, put on a good showing. London Classic Theatre has numerous other performances lined up in their Ireland and UK Tour, all of which can be found on their website. If in the vicinity during one of these shows, this writer ‘earnestly’ implores potential spectators to attend – as one of the defining comedies of the fin de siècle and heralding in the new age of Edwardian writers, this is a show not to be missed.